David Favre is one of the pioneers of animal law. He was the founding officers of the Animal Legal Defense Fund, his books on animal law has become standard in the field, and he’s received numerous awards for his tireless legal advocacy. He is perhaps best known for two ideas: first, the proposal that the law should recognize animals as “living property”; second, the thought that the appropriate standard for assessing the treatment of animals is “respectful use.” Favre offers the former as an alternative to current models of property rights, which don’t distinguish between living and nonliving possessions, and so place few limits on the way that individuals may treat the animals they own. A category of living property would make it easier to assign legal rights to animals, and wouldn’t require overthrowing the notion that animals can be owned in the first place — as abolitionists advocate. 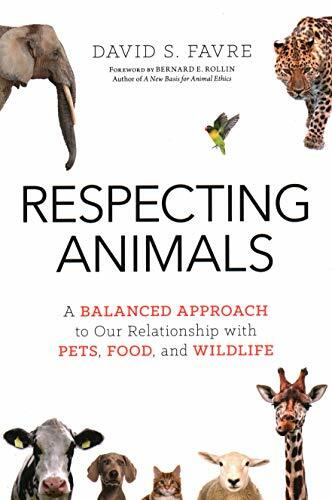 However, Respecting Animals is primarily about ethics rather than the law, focusing on the respectful use standard. Favre’s aim is to summarize his case for this approach, gathering together thoughts from an entire career, and as a result the book is remarkably wide-ranging. It includes discussion of the moral status of animals, the nature of moral judgment, and the complicated interplay between private and collective ethics; he reflects on the scope of our power over animals, wildlife management, the ethics of killing, and the limited influence that ethics has on corporate activities. The basic picture is as follows. According to Favre, we may indeed use animals for our purposes, but we have to do so in a way that reflects “the internal acknowledgment of another being who is deserving of your time, attention, and resources” (45). That is, we may use them, but we have to do so in ways that demonstrate appropriate regard for their interests, acknowledging that they do indeed have perspective on the world that’s distinct from our own. What counts as giving these interests appropriate consideration? Here, Favre is hard to pin down. As he stresses repeatedly, he believes that “ethical decisions are personal and complex decisions not subject to fixed formulas” (49). So, those looking for a moral decision procedure will be disappointed. However, Favre does give two forms of guidance for these decisions. First, he stresses the importance of attending to the kinds of relationships that we have with animals. It’s permissible, he thinks, to raise and kill animals for food, and this partly because farmers can have a particular relationship with animals that legitimizes the costs to the animals under their care, one where animals are afforded a kind of life that they would never have were there no plan to use their bodies and byproducts. Second, Favre encourages us to ask a host of questions. Whatever the situation, there are several questions that we can ask to check whether our use of animals is respectful — whether it truly involves recognizing animals as beings with interests that deserve our consideration. We won’t always agree about the answers to these questions, but Favre seems to be optimistic about the their ability to prompt better human/animal relations. If, for instance, we’re considering whether to declaw a cat, we might ask ourselves about the ways that the cat may be harmed by the procedure itself, about the ways that the cat will be worse (and, potentially, better) off after the procedure, about the strength of our self-interested reasons favoring declawing, as well as about how we found ourselves in a position where declawing seems like the best option. That is, what choices have we made to create a situation where we’re tempted to remove a cat’s claws? Favre’s approach is simultaneously refreshing and frustrating. It’s refreshing in that it reflects a welcome humility to with respect moral discourse. It’s incredibly difficult to secure agreement about almost any moral matter, and we may be inclined to conclude, on that basis, that we ought to approach ethical issues in the pluralistic, question-oriented way that he recommends. For Favre, we are more likely to make moral progress by considering poems and late-night conversations between friends — both of which the book contains — than consulting traditional moral theories. At the same time, though, it’s frustrating when we imagine the conversations that Favre conveniently ignores. He’s happy to say, for instance, that dogfighting and factory farming are simply beyond the pale; on his view, there is no way to construe these behaviors as respectful use. I’m inclined to agree, but it’s striking that not everyone does, and Favre gives us very few tools for criticizing those who reach the opposite conclusion. Of course, this may not really be Favre’s fault: perhaps the problem is that we simply can’t argue people into submission, and instead of pretending otherwise, Favre is simply acknowledging this unpleasant reality. Whatever your view here, it’s worth examining Respecting Animals to see what modest moral discourse looks like, and to assess whether it is, in fact, the best we can do. Bob Fischer teaches philosophy at Texas State University. He's the editor of The Moral Complexities of Eating Meat (Oxford, 2015; with Ben Bramble) and College Ethics: A Reader on Moral Issues That Affect You(Oxford, 2017). He's also the author of several essays on animal ethics, moral psychology, and the epistemology of modality.